Since 1 December 2012, Lencia Medium and Lencia Light have been available for download as beta versions on this website. It is possible to download the typeface for a free trial. It is not permitted to use the Lencia Typeface for commercial purposes. What began as nothing more than an exercise to learn more about typography soon grew into a project to develop an entire font family. Back in 2002, Thomas Feichtner began developing “Lencia” (at the time still under the working title of “Linz Schrift”), named for his hometown of Linz (Latin: Lencium). Feichtner’s interest was in creating a simple, sans-serif font based on circle segments as well as vertical and horizontal axes. In contrast to the time-honored methods used by experienced type designers, Feichtner approached his project more as if designing a product. Lencia follows a grid of radiuses, angles, cones and intervals, resulting in a common formal language that can be recognized in every letter. Feichtner constructed each of his letters according to a unified style for stems, crossbars, legs and overshoots. Cap height corresponds with the ascenders of the minuscules, the x-height of which is set conspicuously high. This gives rise to a character that is particularly distinctive when used in captions. The type styles light, medium and bold each adhere to distinct grid-level metrics in terms of thickness, letter-spacing and position, yet still present a homogeneous appearance when viewed together. Thomas Feichtner developed Lencia using a piece of software that was quite popular among typographers during the early 1990s. Since this software was incompatible with newer operating systems, 2003 saw Feichtner conclude his design process in a vector program without having actually produced a finished computer font. Later on, nearly 10 years after he had completed the initial design for Lencia, the aforementioned, tried-and-true software package for creating scripts reappeared on the market in an updated version. 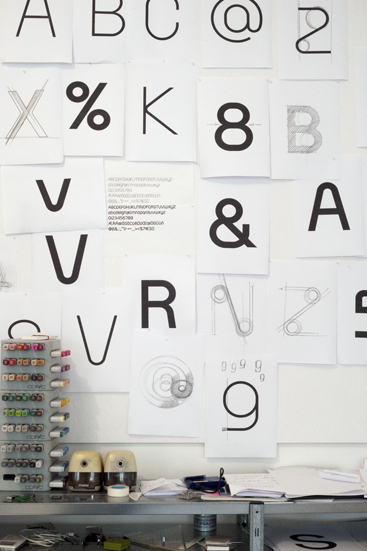 Feichtner took this opportunity to finish his design and release the typeface in 2012. Was vorerst nur als eine Übung begann, um sich in das Thema der Typografie zu vertiefen entwickelte sich schnell zu der Entstehung einer ganzen Schriftenfamilie. 2002 begann Thomas Feichtner mit der Entwicklung der „Lencia“, damals noch unter dem Projektnahmen Linz-Schrift, benannt nach seiner Heimatstadt Linz (lat. : Lencium). Feichtners Interesse galt einer simplen serifenlosen Schrift aufgebaut auf Kreissegmenten sowie Vertikalen und Horizontalen. Im Unterschied zu der bewährten Methodik eines geübten Typografen, nähert sich Feichtner dem Entwurf ähnlich der Gestaltung eines Produktes. Die Lencia folgt einem Raster von Radien, Winkel, Kegeln und Abständen, dass jeder Buchstabe die gemeinsame Formensprache erkennen lässt. Jeden Letter konstruierte Feichtner nach dem selben Duktus von Stamm, Querstrich, Schenkel und Überhang. Die Versalhöhe entsprich der Oberlänge der Minuskel wobei die Mittellänge auffallend hoch ist. Dies erzeugt gerade für Überschriften ein eigenständiges Schriftbild. Die Schriftschnitte Light, Medium und Bold folgen dabei einem völlig unterschiedlichen Raster von Stärke, Laufweite und Lage der Schrift, die dennoch ein homogenes Schriftenbild erzeugen. Thomas Feichtner entwickelte die Lencia mit einem, unter Typografen sehr beliebten Comuterprogramm der frühen 1990er Jahren. Mit der Inkompatibilität des Programms zu jüngeren Betriebssystemen beendete Feichtner 2003 den Entwurf zunächst nur in einem Vektorprogramm. Jedoch nicht als Computer-Font. Knapp 10 Jahre nach dem ersten Entwurf zur Lencia, wurde das bewährte Programm zur Schriften-Erstellung neu aufgelegt. Thomas Feichtner nahm dies zum Anlass seinen Entwurf abzuschließen und die Schrift 2012 zu veröffentlichen. Ab dem 1. Dez. 2012 steht die Lencia-Medium und Lencia-Light als Beta-Version auf der Website www.thomasfeichtner.at zum Download zur Verfügung (siehe oben). Es ist möglich, die Schrift als kostenlose Testversion herunterladen. Es ist nicht gestattet, die Lancia Typeface für kommerzielle Zwecke zu nutzen. Alle Rechte vorbehalten. Trotz sorgfältiger Kontrolle, weisen wir Sie darauf hin, dass wir für Schäden und Betriebsstörungen, keine Haftung übernehmen.